Download images and files from a web page - Just provide the URL and choose where to put them! Put the full URL in the address bar at the top and click Scan. SimpleDownloader will read the whole page and look for images and links to files and then display a list below. Select the files you want, Ctrl+Click to choose multiple files, Shift+Click to choose a range of files. Click the directory path at the bottom (My Pictures by default) to choose a different output directory if you wish. Click the Eye icon to launch SimpleViewer and view images in the selected directory. Click the Download button to begin downloading all the selected items to the selected directory. SimpleDownloader will not try to overwrite any files with the same names. That's it! SimpleDownloader will remember the last URL and directory of your choice for next time. View JPEGs, PNGs, TIFFs, TGAs, GIFs and even animated GIFs! Cycle through all images in a directory with the arrow keys. Press Home or PageUp to view the first image in the current directory. Press End or PageDown to view the last image in the current directory. Press Delete to instantly send the current image to the Recycle Bin. Press S to begin a slideshow, automatically going to the next image every 3 seconds or when the animated GIF ends. Press M to select a directory and move the current image to that directory. Press R to rotate the current image by 90 degrees. Press X or Y to flip the current image horizontally or vertically. Press Enter to toggle Full-Screen mode. Press the Space Bar to toggle resizing mode between Fill, Uniform, Uniform-to-Fill, and Actual Size. Press Escape to close the app instantly. SimpleViewer remembers the last directory you have viewed. It defaults to your My Pictures directory. 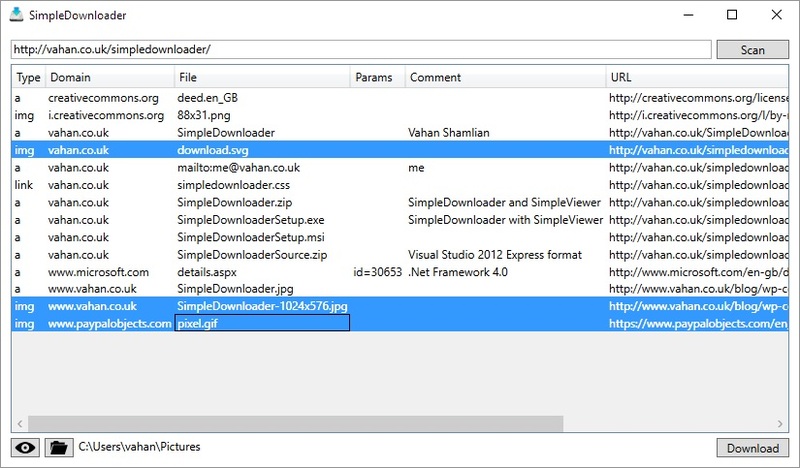 Download SimpleDownloader with SimpleViewer completely free! .Net Framework 4.0 is required. A Zip file containing SimpleDownloader and SimpleViewer for manual installation. The source files for the entire project in Visual Studio 2012 Express format to help out with the project. SimpleDownloader and SimpleViewer by Vahan Shamlian are licensed under a Creative Commons Attribution-NonCommercial-ShareAlike 3.0 Unported License. Based on a work at http://vahan.co.uk/simpledownloader/SimpleDownloaderSource.zip. This software is provided FREE OF CHARGE and with NO WARRANTY OR GUARANTEE of any kind! Nobody but the user can be held responsible for any loss resulting from the use of this software. You have been warned! If you paid to purchase this software, you've been scammed! Get a refund! If you find this software useful and wish to contribute to further improvements, please donate some money. Your contributions will not go unnoticed! SimpleViewer New Feature: Slideshow Mode. Press S to begin automatic "Next" after 3 seconds or at the end of the GIF animation. SimpleDownloader New Feature: Browse in Explorer. A new button appears with a folder icon next to the eye icon. I have created my own Installer and Uninstaller for this project, the installer will always fetch the latest version and will overwrite existing files if they exist. Completely rewritten download loop; fixes the problem of downloads starting prematurely which confused the progress bar and continued downloading files when the process appeared to be complete. Progress bars now have text overlays for more information about the current progress. The "Download" button becomes "Stop!" while downloading - we now have the possibility to cancel downloading. Existing files are skipped more efficiently. It is now possible to select multiple Scan results by click+drag. It is now possible to sort the Scan results by clicking on column headers.